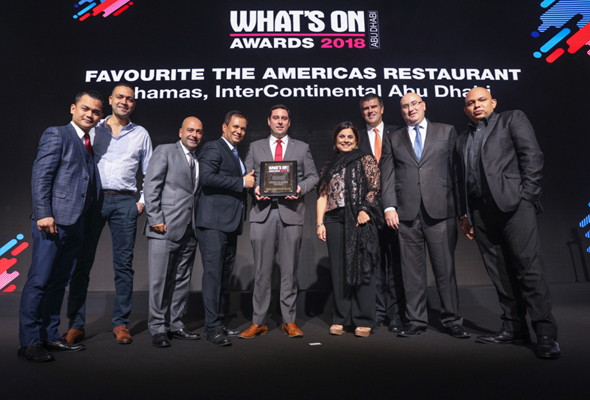 Last night, at a glittering ceremony at the Grand Hyatt Abu Dhabi, the city’s entertainment and hospitality industries were celebrated at our annual awards ceremony. 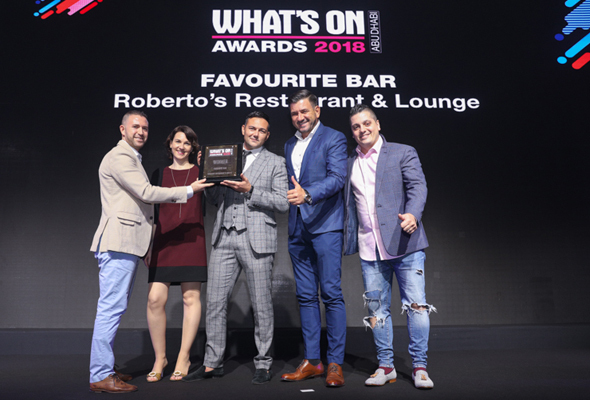 The majority of the awards are voted for by the general public, with just our four ‘Grand Prix’ (including the coveted Restaurant Of The Year award) trophies being chosen by the team at What’s On. So, here are the city’s best spas, restaurants, bars, concerts and more, as chosen by you, our army of readers. Last year, Coya took home our Newcomer of the Year award, and it’s continued to impress us ever since. The pan-Latino consistently delivers in terms of service, food and decor. 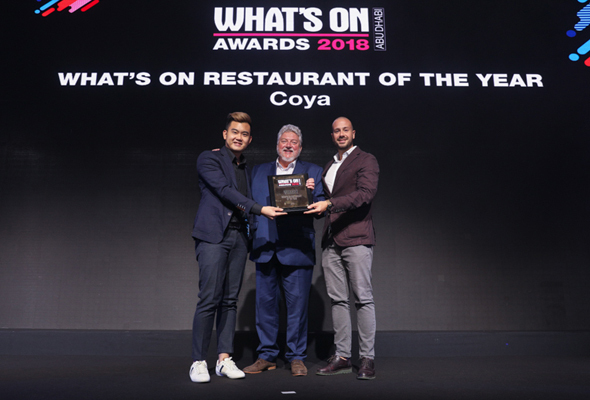 Coya thinks outside the box and, that’s why we, and the rest of Abu Dhabi, love it so much. 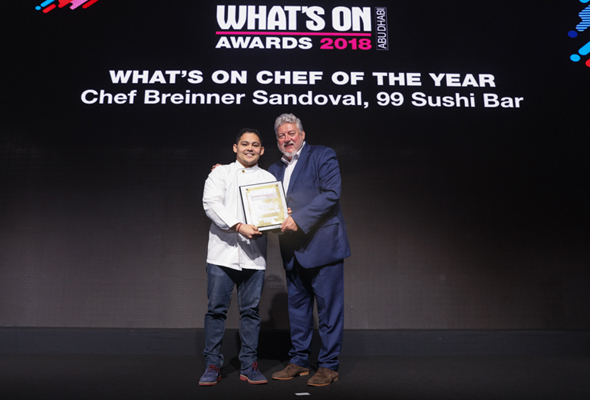 Chef Breinner Sandoval, of 99 Sushi Bar works tirelessly to consistently deliver new and exciting dishes to the menu at his upscale sushi restaurant. And it must be working, because the people keep coming back, again and again and again. 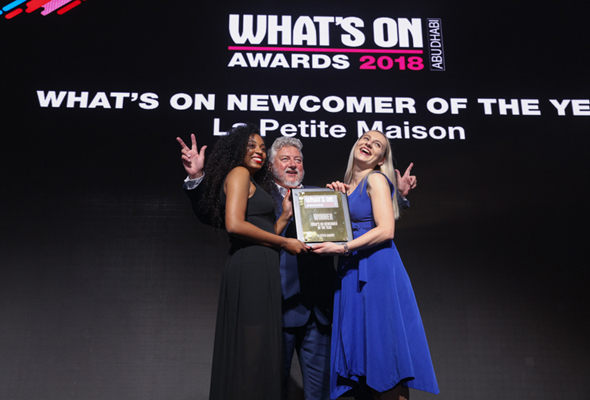 La Petite Maison was one of the most anticipated openings of 2017, and when it opened its doors in October last year, it was on to a good thing from the very beginning. 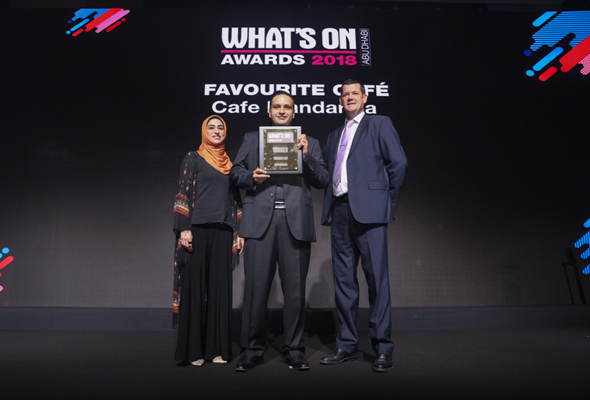 The high standard of food and service that has won this restaurant so many accolades in Dubai has transferred successfully to the capital, and it’s done everything right from day one. 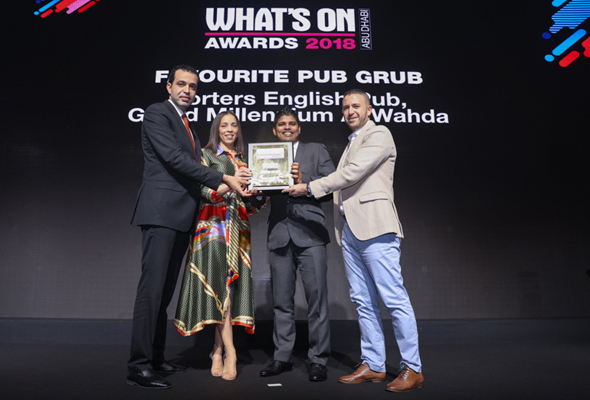 Arguably home to the best gluten-free food in Abu Dhabi, this spot is no stranger to a What’s On award. 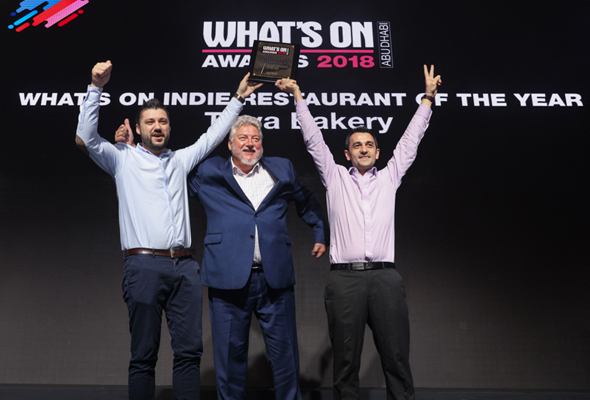 Coupled with the spectacular views of the ocean, it’s no wonder that Tawa Bakery is once again our Indie Restaurant of the Year. 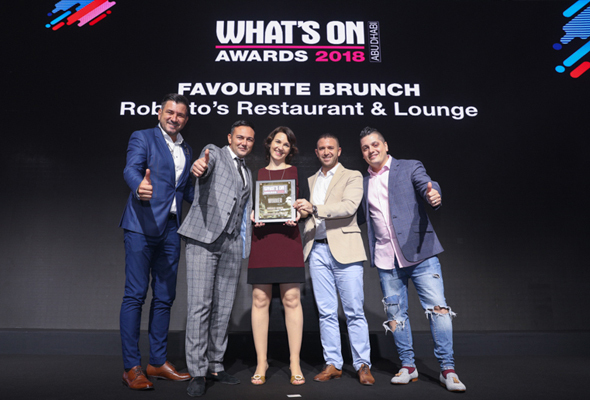 It’s an elegant affair at the Roberto’s Friday feast, with a mix of traditional antipasti served to the table, a pasta course and a la carte main offering. Save room for dessert, we rate the dessert buffet in the lounge highly. 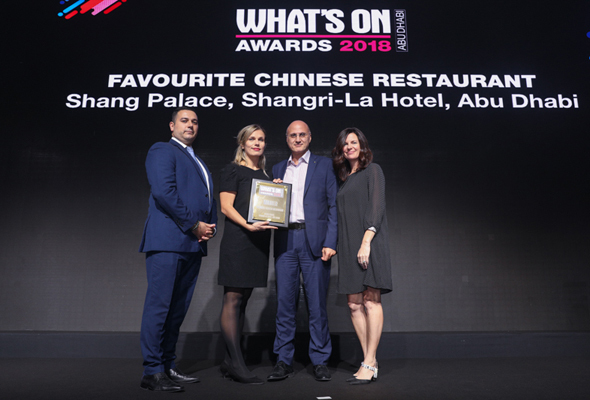 The mighty Shang has stood the test of time in the capital, and the previous What’s On Awards winner is back among the gongs this year, beating the equally mighty Hakkasan to the trophy. 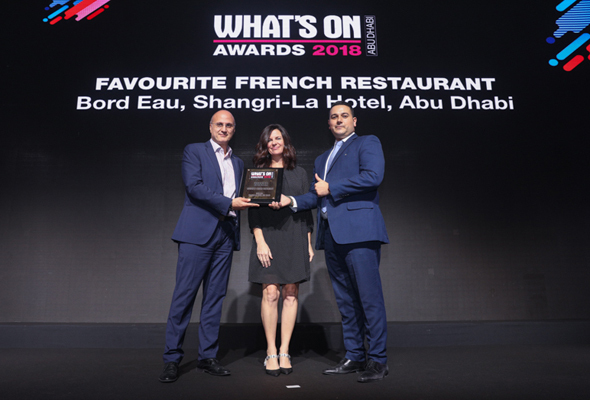 It’s no surprise to see it Bord Eau back amongst the trophies this year, it’s once again been voted the city’s best French spot. 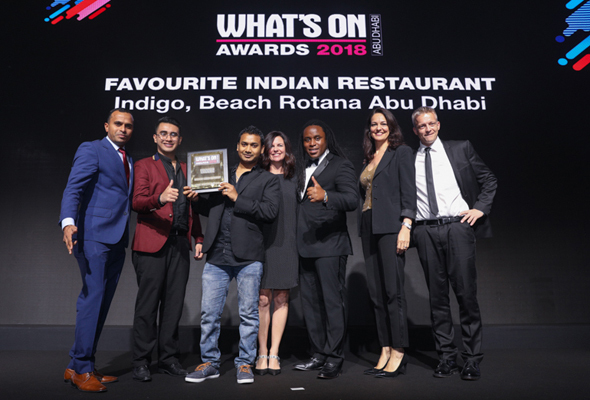 Promising an avant-garde approach to Indian cooking, it’s a modern fusion of dishes you’ll find at Indigo. While a blend of Indian, Italian and Asian dishes may not sound all that appetising, Teatro manages it and then some. 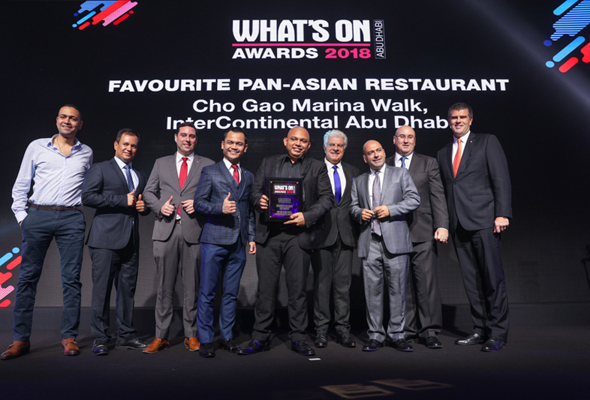 Whether it’s for a seat al fresco or in front of the many live cooking stations, this restaurant is well worth a visit. 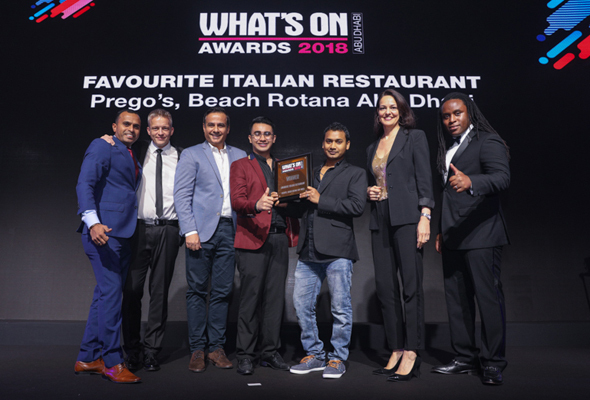 With a stunning terrace, wood fired pizza and pasta freshly made daily, it’s no wonder reservations are essential at Prego’s Italian restaurant. Looking for some top Japanese cuisine in the capital? 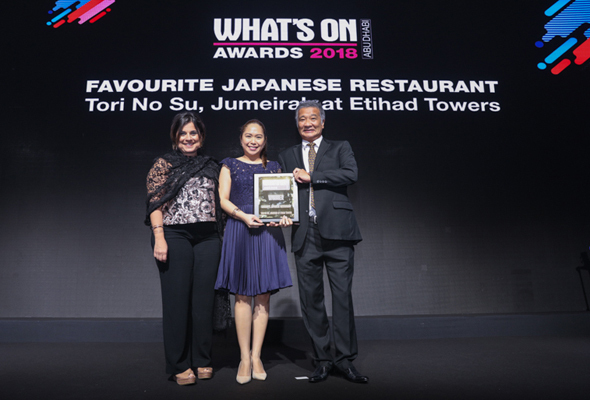 Look no further than Tori No Su, the gourmet Japanese restaurant in Jumeirah Etihad Towers. 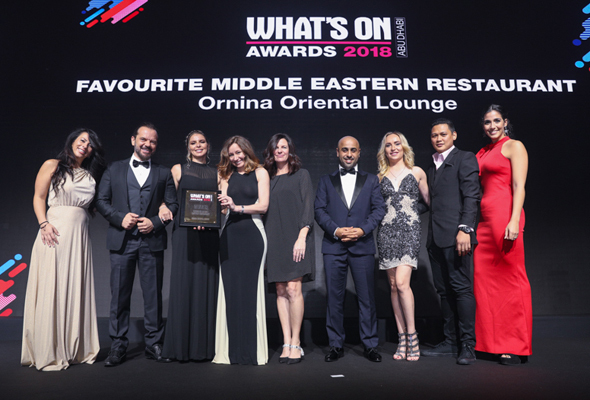 The name suggests this should be an Asian restaurant, but Ornina Oriental actually serves high-quality Arabic and Middle Eastern dishes. A unique exterior and awesome views of the ocean around Yas complete the package and make for a worthy winner. Cho Gao has been rammed for years, in part because it proves you don’t have to pay five-star prices to get five-star Asian food. We’re big fans of their Mie Goreng Indonesian noodles. 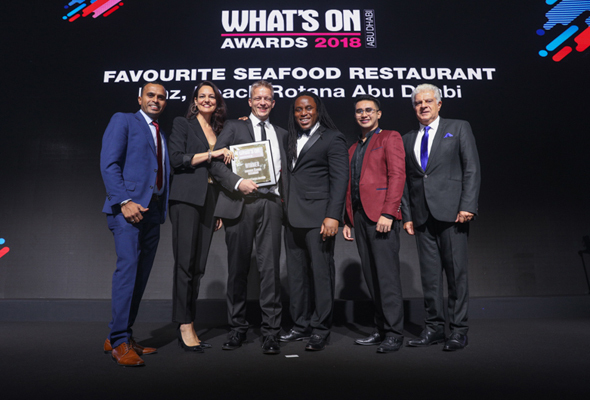 Situated at the back of the Beach Rotana beside Abu Dhabi Mall, the waterfront restaurant feels miles away from the bustle of Abu Dhabi. For a lazy, hazy day in the sun for seafood lovers, Finz is hard to beat. This contemporary steakhouse is a meat lovers paradise. It’s also a height lovers paradise, found on Level 63 of Jumeirah Etihad Towers. Whoever thought anyone could been Sontaya to the top Thai restaurant in the capital? Well it has, which means Benjarong is pretty special. 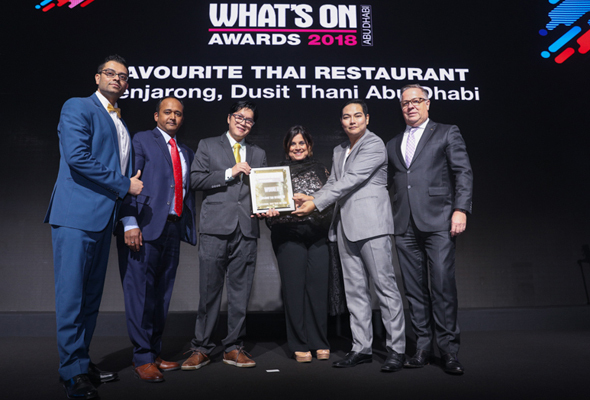 After undergoing an upgrade last year, this Thai restaurant has become one of Abu Dhabi’s go to spots for top Thai cuisine. Chamas’ unique serving system of green and red signs (to tell the staff to continue bringing you meat or to stop) makes it one the main reasons we’re victims of the Abu Dhabi stone – we never, ever want to turn our sign red. 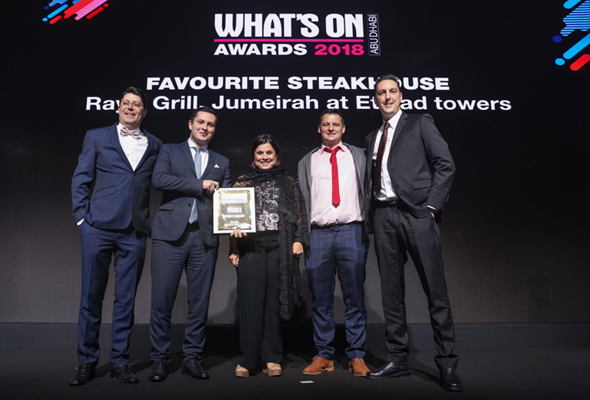 The jovial atmosphere, fun staff and high-quality meat on offer make this exceptional value and a go-to place for many in the capital, time and time again. 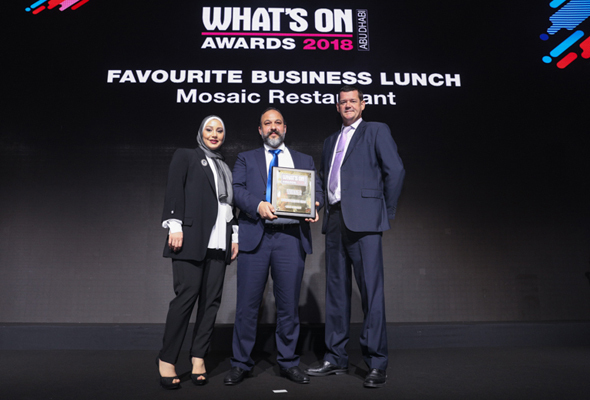 For a quick Business lunch of top Lebanese food, head to Mosaic. Prices are reasonable and everything is homemade, from the Tabbouleh to the Kibbeh. This hidden gem in Al Rabbha is not about the most modern cooking techniques or finely finished dishes, instead it puts its focus on producing fresh, nourishing dishes, this family-run business is a great spot to enjoy lunch with the family, or gathering with friends. 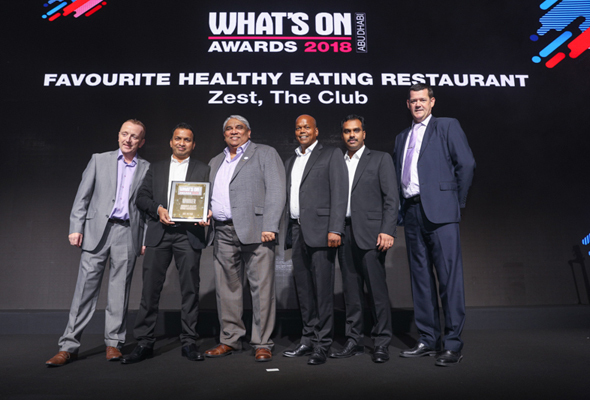 Abu Dhabi’s British Club in Al Meena has now won four years in a row with its healthy eating outlet Zest. It gets clever with its menu and we’re big fans of its smoothies (whey protein and peanut better, please) plus it also offers gluten free dishes. With a popular daily happy hour that runs until 9pm, value n0-frills Friday brunch and wide screens for streaming all the big matches live, you’d do well to find a better place to wile away a game day than Porters English Pub. A night out in Abu Dhabi isn’t complete without a trip to Roberto’s. 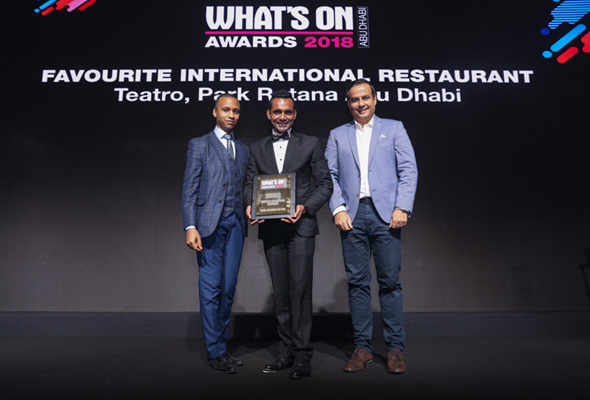 The upscale restaurant and lounge made its name in Dubai, but it’s proved quite the hit in the capital too. 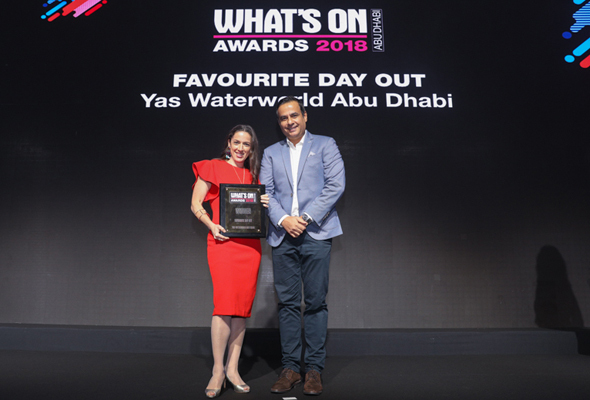 The city’s iconic waterpark has been a top day out since it opened back in 2013. It’s home to more than 40 waterslides, rides and attractions, but it’s not just stuck at that. Year on year it’s brought us new events and activities including a Mermaid School, in-water, 5D cinema and evening pool parties with international artists, and it’s no wonder families keep flocking back. 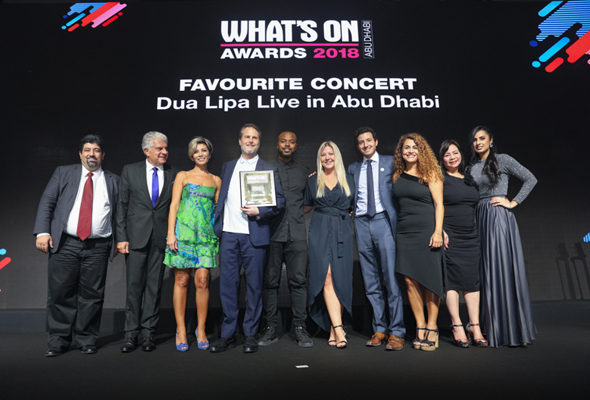 It was the first time that Dua Lipa had performed in the region when she headlined du Forum back in February to a sellout crowd. Refreshingly energetic and engaging, the New Rules hitmaker performed her heart out and dazzled fans at the gig, put on by Flash Entertainment. Proving that not all ladies’ nights are about three free drinks, scooping this year’s award is a more alternative ladies’ night. 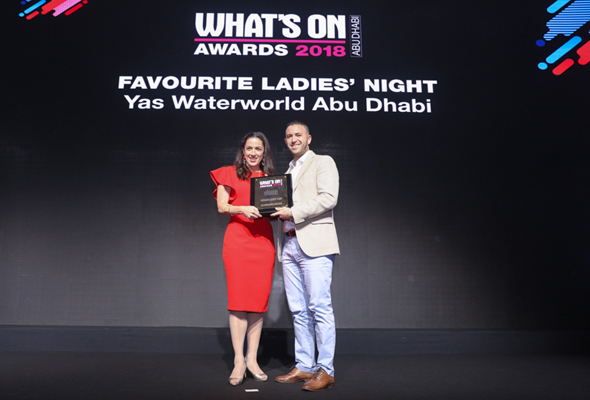 The weekly event at Yas Waterworld is dedicated to ladies-only, and comes complete with a full female crew, female DJ and dedicated activities such as Zumba classes. 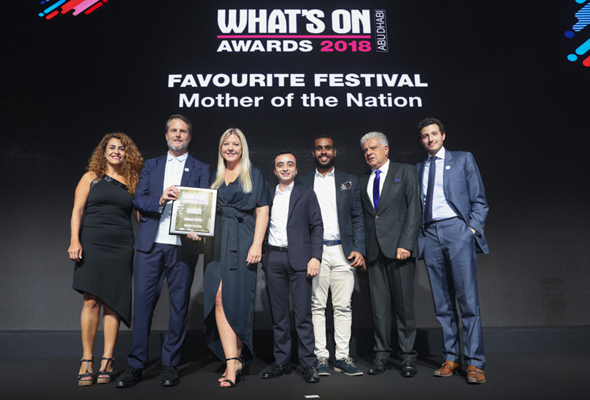 Whether it’s beachfront dining, a dedicated ‘Happiness Zone’ filled with family-friendly activities, or an exhibition highlighting the life and works of the woman who inspired the festival, HH Sheikha Fatima, the wife of the late Sheikh Zayed Bin Sultan Al Nahyan, the Mother of the Nation Festival has something for everyone looking for a great day out. 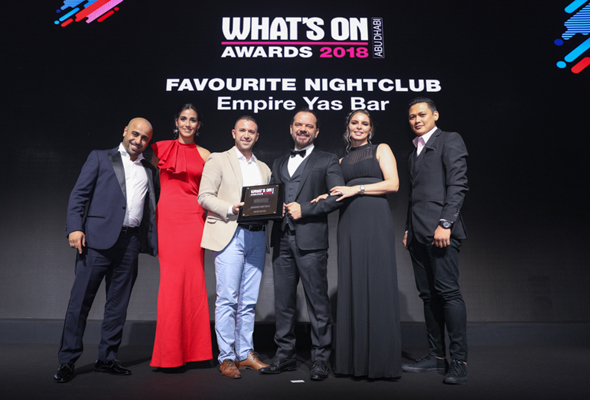 Empire opened last summer right next door to the Yas Viceroy and proved an instant hit, thanks in part to its great mix of events (R&B evenings, Arabic evenings, ladies’ nights), plus a state-of-the-art LED and sound system. For the second year in a row, it’s your favourite nightclub. 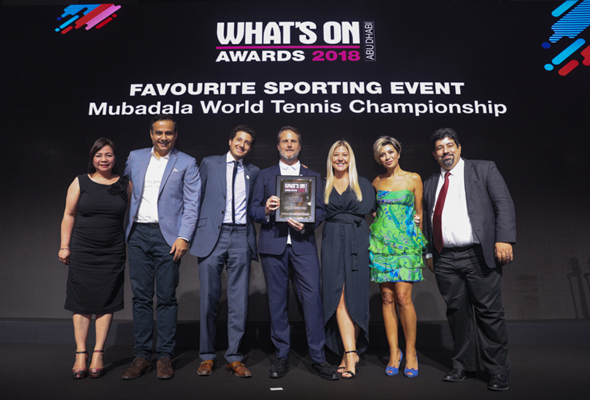 There’s some tough competition in the Favourite Sporting Event category, but the sellout stadium matches of the Mubadala World Tennis Championship are fast becoming one of the most exciting sporting events of the year.